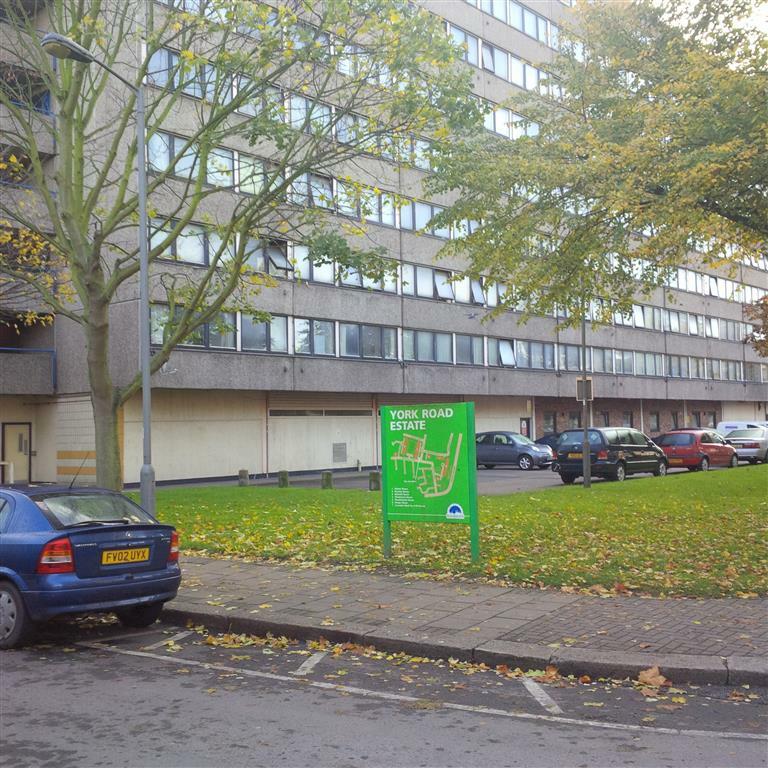 We note with interest the various proposals to upgrade the Winstanley and York Road estates and are pleased to see that the council is consulting the local people about what they would like to happen. The council has the opportunity to improve the environment and social mix of the area but it needs to be very conscious of the mistakes of the past and to avoid repeating them. Sixty odd years ago the whole area was a network of little streets, housing thousands of people in admittedly sub-standard small properties. Today the houses would probably be refurbished and brought up to date, but the old Battersea Council merely saw slums. It broke up communities, took away something most families want…a house with its own private space (at least, a little back yard), and streets that led somewhere, not just into a concrete warren of dead ends. It also (inevitably) filled the majority of the new flats with same-age young families creating an unbalanced society from the start. An aerial view of the area shows that at present there is a surprising amount of green space. We think it essential that this should not be reduced. It can also be used to link groups of properties. We like the emphasis on improved roadway links. We think also that developing the York Road frontage to some degree would be beneficial. We are not convinced that the ‘station piazza’ by Falcon Bridge will do much to enhance, particularly as it can only be achieved by the demolition of the Bramlands properties. These are not particularly attractive but are well liked by those who live there. It seems a needless community disruption. Improvements to the existing street scene could be made with plantings, interesting pavings etc. and removal of car-parking on the forecourts of the corner properties. The Church of the Nazarene is also quite an interesting building. Why destroy something that at present adds some character to Grant Road? It is clear that the residents of the estates do not want the proposed (or any more) tower blocks and we strongly support them in this. Towers are largely an architectural fashion. They dominate, cast shadow, create uncomfortable windy zones, and steal our sky. In this area they go against the recommended policies of the SSAD where anything over 5 storeys is considered tall and the area is marked as ‘sensitive to’ tall buildings. We think the suggested addition (all options) of some small houses along the Grant Road frontage of the Winstanley Estate is an acceptable way of increasing the number of homes. If the York Road frontage is built upon it will mean the loss of a sizable area of the park and this will need to be replaced. The local people do not want to lose any area of open space. The proposal for the park in Option 1 (‘moderate change’) is an interesting solution to this. Most people seem to favour the demolition of the three soul-destroying slab blocks of the York Estate (Pennythorn, Holcroft, and Scholey) and we agree that this would do much to improve the whole appearance and cohesion of the area because they could be replaced with lower rise, larger-sized, family homes. The social mix of the area is already different from a few years ago because quite a number of flats are now privately owned and either owner-occupied or privately rented. It will be important to keep as many as possible of the remaining estate flats as social (cheap rent) housing as this is the great need in Battersea/Wandsworth. In considering the compensation paid to owner-occupiers, the council needs to do much more than pay the current value of the flat. It needs to realise that these families will be forced to live away from the area as property prices in the borough will preclude them from buying locally. It seems that the status quo, albeit with refurbished properties, is not generally approved. The original proposal (‘change’) of demolishing the York Road Estate with its out-dated slab blocks, with the extra houses along Grant Road would be the least disruptive of the three options. However it precludes development along York Road, presumably one of the money-making projects for financing the scheme. Option 1 (‘moderate change’) would be a good compromise, but we think it unnecessary to remove as many of the Winstanley flats as proposed and we do not think Bramlands or the Church of the Nazarene should be demolished. We consider Option 3 to be far too destructive for the communities and it would cause the biggest logistics problem over re-housing existing tenants. Flexibility within Options 1 and 2 is probably the best way forward. Whichever scheme finally emerges, the refurbishment of these estates also gives the opportunity to impose an innovative integrated water management system across a wide area. This entails considerable reduction in non-permeable surfaces, more tree planting in bio-retention blocks, below-surface water tanks to store water for slow release, and green roofs etc. All designed to ‘slow the flow’ of surface water into the drains and hence into the sewage system, the cause of much pollution of the River Thames. While disruption is best avoided where possible, I don’t really see a very strong rationale for keeping Bramlands Close: it has dated badly, meaning neither the shops nor the flats are anywhere near being up to current standards of space and access, and the building is a mess. Its rather dubious appearance and poor sight lines give a bad first impression of this side of the station, and probably affect the success of the small businesses further up Falcon Road. More importantly though, if we accept that to make an omelette, Wandsworth will need to break some eggs (and I’m well aware not everyone will agree with me here) I think the area the Bramlands buildings occupy is likely to be one of the more profitable parts of the site to increase the density of, given its proximity to the station, thus generating some of the funds that will be needed to upgrade the wider estate. If the large existing blocks are going to be got up to a better standard, it’s going to take a lot of cash, and the number of affected tenants in Bramlands is small compared to some of the other buildings that are likely to face demolition. I’d hope that whatever the outcome, we end up with a more legible and transparent pedestrian route from the station exit to the Falcon Road, and if possible to the main body of the estate. A building layout that at least makes passive provision for a safer and higher quality bus interchange in the future would be a plus (I’m aware this has had some consideration, and if Crossrail 2 ever stops here it’ll be essential – but it’s not clear of this features on the current sketches). 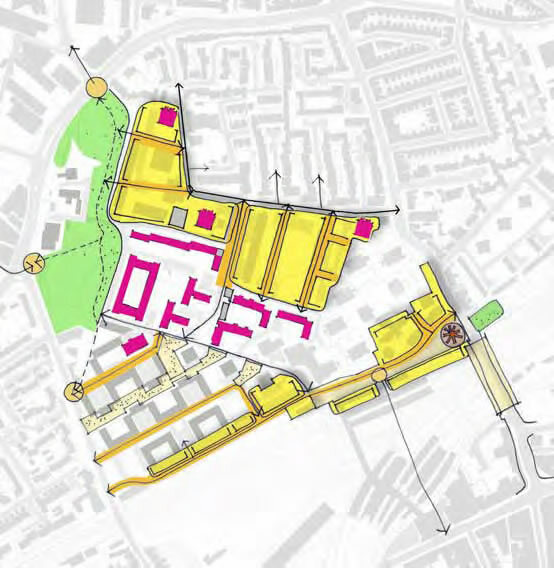 It would be good to make some space for shops between the station and the way in to the wider estate; and maybe to open up the arches under the railway a bit more – reflecting what Bramlands Close was trying to do (but where it may not have fully succeeded). According to the plan, buildings kept will be completely refurbished. So, if the job is nicely done, Bramlands Close will not seem as derelict as now. That said, it might be possible to replace Bramlands Close with a considerate and sensible developments (i.e. not new 20, or 15, or even 10 storey towers). However I would imagine that in that case appropriate compensation is given to the people living there. Your comment raises the need of a bus interchange. However, according to the current master plan, there is no such scheme, and actually they even plan to completely remove the current bus stands. And I agree with your conclusion: we too hope that this all leads to more space, and more green in a human scale scheme. 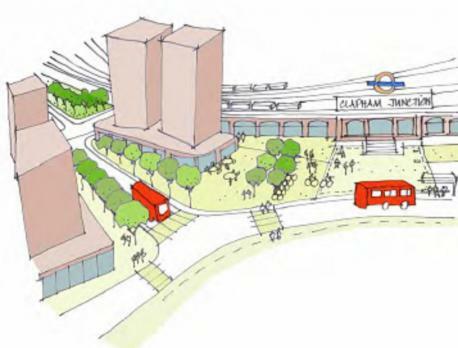 With such a project there is a great opportunity to improve massively this part of Clapham Junction, we don’t want to miss it.